Le Club Accorhotels has a great sale for stays in South America between December 19 – February 13, 2015 (that should have ended already). Participating hotels are offering fixed prices that are brand dependent for the stay period. The Christmas Sale offers much lower prices than other discount rates. 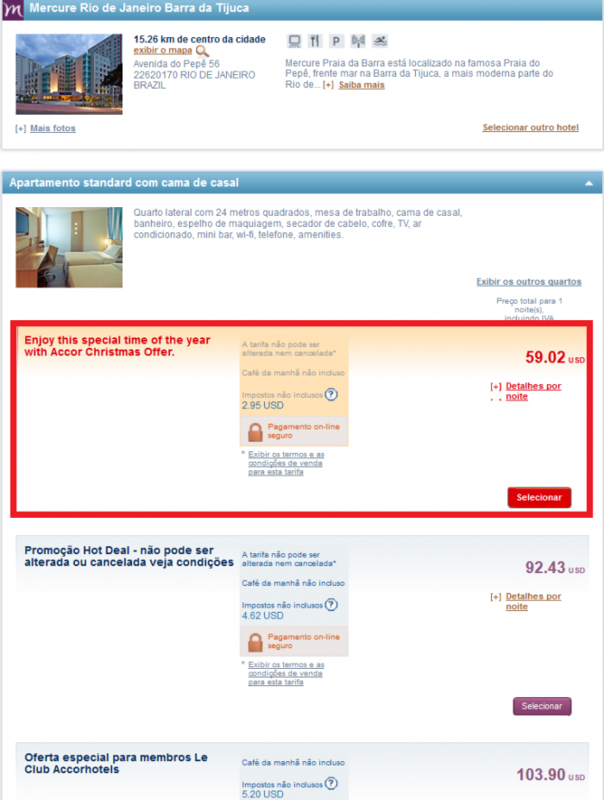 The Mercure hotel in Rio also has the fixed price rate loaded. I just came across this sale today. Although it should have already ended, the hotels seems to be still offering these discounted rates. Not sure why Accor prefers to hide these sales? Wouldn’t promoting them make potential guests more likely to stay at their hotels? The rates at the hotels that I checked are really good considering the rates that tend to be available nowadays especially in Brazil.